At this point you are probably wondering, "so how gluten-free/vegan are these cupcakes really?" After all, Red Velvet Cupcakery is by no means a dedicated facility. The staff are knowledgable and intentional about keeping the cupcakes separate, using separate utensils and bowls and baking them at dedicated times on clean equipment. Of course there is always a chance of cross contamination when the facility is not dedicated gluten-free, but I felt comfortable with the care they took. My favorite of the cupcakes was the white velvet with the "buttercream" frosting. 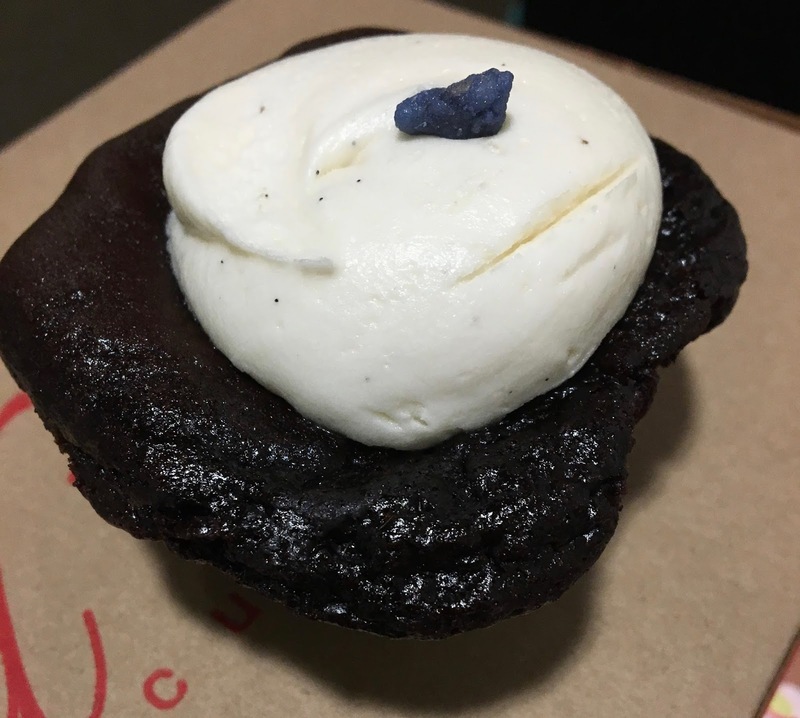 If I didn't know better, this cupcake could have easily fooled me that it was not gluten and dairy-free. The cake was moist and had a crumb that was dense but still airy. The vanilla cake was lovely with hints of banana and the frosting was impossibly creamy and sweet. 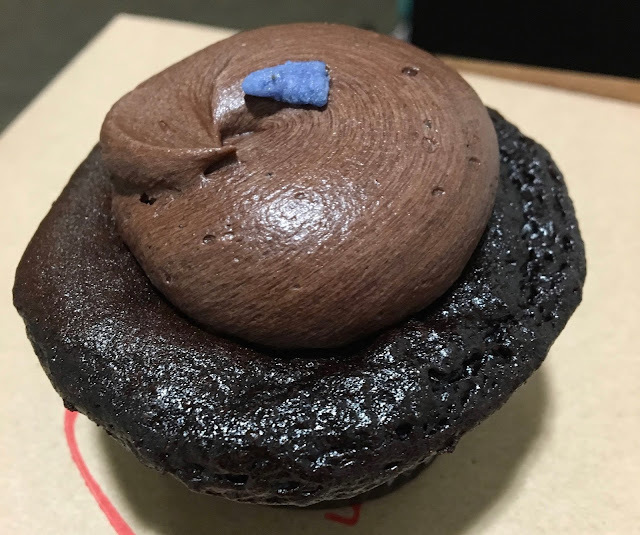 In shape, texture, and taste it surpassed my expectation and was a "Mary Poppins" cupcake- practically perfect in every way. Ranking in third of the four cupcakes I bought was the white velvet/chocolate frosting combination. 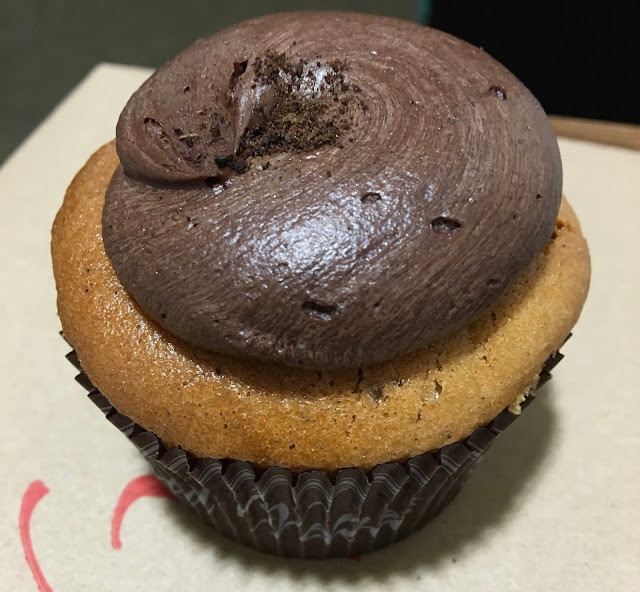 This cupcake had the same deliciously perfect base that I've described before but lost points with the chocolate frosting. It was smooth, sweet and creamy, but did not have a strong chocolate flavor that I expected. Don't get me wrong- it was still a impressive cupcake- just not one that met the high bar set by the two cupcakes described above. Rounding out the foursome was the chocolate/chocolate cupcake. Coming in last should not be seen as a commentary on quality, because the cupcake was really good and better than ones I have tried before. Where it lost points was the chocolate frosting that was less chocolatey than I was hoping for and a base that was "off" texture-wise; it was a bit dry in some parts and gooey in others. Red Velvet Cupcakery has become my new favorite bakery in town. Delicious cupcakes at an affordable price that I don't have to special order? Check, check, and check. 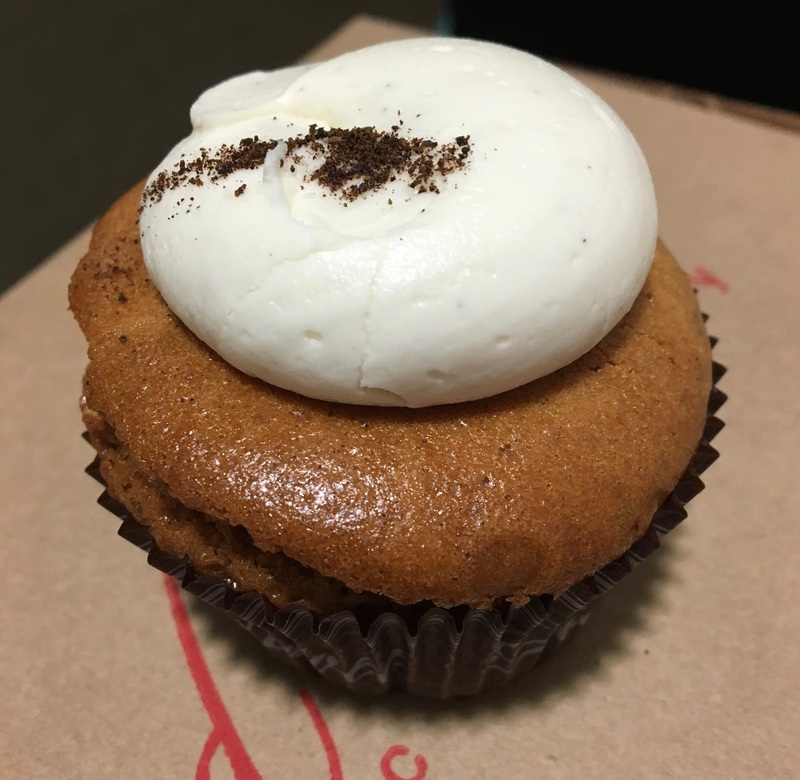 As icing on the cake (pun intended), they do care about allergies and strive to ensure their cupcakes are safe and as free from gluten and animal byproducts as they can be. 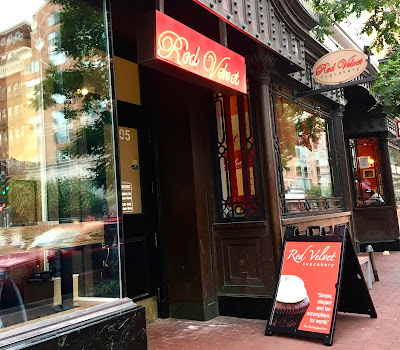 I will for sure be a frequent customer, and like how the cupcakes are not sickeningly sweet or fall into any of the stereotypes of gluten-free cupcakes (cardboard, flavorless, hockey pucks, etc. ).